I’m in good spirits this morning. I’ve been struggling with completing articles for the Spring issue of Spirit magazine, the alumni magazine that I edit. This morning, since my wife had to get up early and go to work, I got up with her. I always think more clearly in the morning, especially when I am alone. This morning I had to deal with three dogs that wanted my attention and a cat that was determined to climb into my lap, but despite it all, I finished those articles. As always, I feel as if a weight has come off my shoulders. Last week I made sure that my classes were prepped and ready to go up until spring break, which is in two weeks. And so, with the exception of a few details, like midterm exams and grades, I am free to pursue my other job. 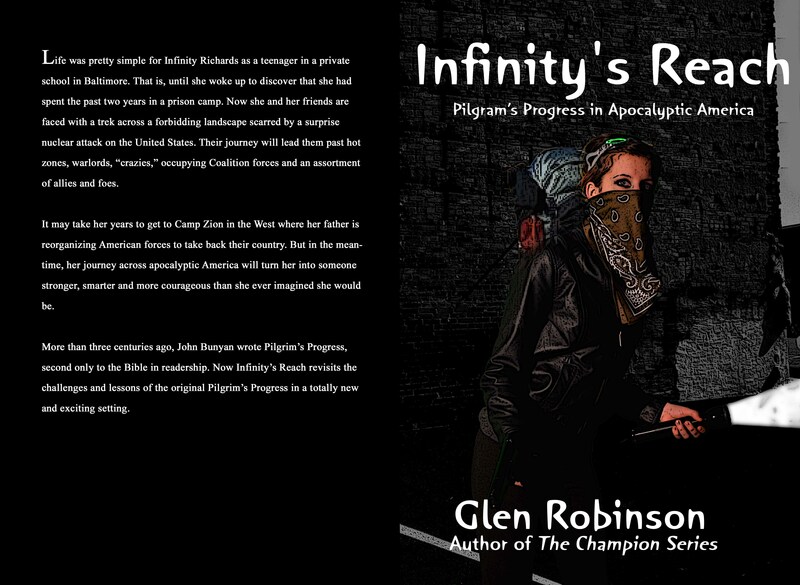 During the summer of 2012 I started writing Infinity’s Reach, my retelling of Pilgrim’s Progress. It’s set in a United States that has suffered a crippling EMP attack, followed by an invasion by forces from Asia. The story follows a teenaged girl from Baltimore to Tennessee and then across the United States in search of her father. I have been excited about the project for a long time, and many people I talk to about it are also eager to see it written. But because I am retelling a story with historic popularity only second to the Bible, I am, to say the least, intimidated. It’s a juggling act. I find myself challenged to balance the Christian message of the story, faithfulness to the original work as well as loyalty to those readers who want an exciting science fiction tale they can sink their teeth into. It’s daunting, and I find myself wondering if I am up to the task. Every author suffers from the realization that the story they want to write is perfect until it has been written. When you write it, it becomes a victim of your own shortcomings as a writer. But the bottom line is, if you don’t write it–even if it not as good as you would have liked–it will never exist, other than just a daydream in your head. The whole purpose of writing is to take ideas and expound on them in a public way so that others can see what you are thinking. At least, that’s my interpretation of the craft. But back to Infinity’s Reach. I have already pledged to myself that during spring break I will finish the last 4-5 chapters that remain unfinished. That’s my absolutely, must-do goal. My second goal is to edit it and have it ready for publication. The cover is done, as you can see above. I know all about formatting, marketing, and all the other necessities of book publishing. I just have to get the book done. I’m not the first author to worry if his work is good enough for the public. And I am sure I won’t be the last.